Benjamin Gorman is a high school English teacher. He lives in Independence, Oregon with his partner, Paige, and their son, Noah. His first novel was The Sum of Our Gods, followed by Corporate High School, then The Digital Storm. He believes in human beings and the power of their stories. He places his confidence in his students and the world they will choose to create if given the chance. When Paige graduated from college, the couple felt strongly that they should be nearer to family, so they had to decide between Cincinnati, Ohio, and Newberg, Oregon. Though Ben prefers the pace and energy of big cities, he loves the natural beauty of Oregon. Paige and Ben decided to move to Oregon, first to Newberg, then to Dundee. Upon arrival, he looked for sales jobs because that was all the experience he had. Luckily, his mother-in-law worked at Newberg High School and told him about a position opening for a translator for second-language-learners. After his first day on the job, Ben was hooked. While working at Newberg High, he got his Masters in Teaching from George Fox University. When he finished the program, he found a job at Central High School, the school that serves the twin towns of Independence and Monmouth, Oregon. Ben, Paige, and Baby-on-the-way moved to Salem, Oregon, thinking it would be a nice halfway point that would keep them closer to friends in Portland and Newberg. That turned out to be a mistake; they eventually realized that the halfway point left them living a very isolated life, so they moved to Independence. Still, those Salem years were good years because they had Noah, their wonderful son who makes Ben happier than he ever could have imagined. 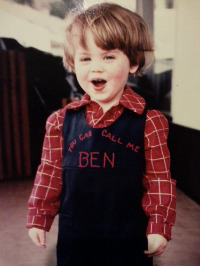 The geographic distance between Ben and the church he loved in Newberg, Oregon gave Ben the chance to reflect on his growing doubts about Christianity as a whole. He realized his attachment to that kind of Christianity had been more moral and political than metaphysical or epistemological; the theology of a Friends church creates a devotion to a tolerant, servant-focused kind of Christianity, and Ben believed in what they did in the world, but it didn’t make him feel any more connected to God. Over the course of many years, Ben came to realize that he’d lost his faith. This process was more painful than his discipleship had been satisfying. He tried to process the loss, the sadness, the love, and the grief in the pages of the novel he was working on at the time, the book that would become The Sum of Our Gods, all in the context of the comic irreverence that was the hallmark of his new agnosticism.